I am a knitter. Therefore, I am covered in wool. I am a knitter. Therefore, I am happy to be “forced” to stay inside and knit. Spring is officially in sight as of today, because today the Detroit Tigers pitchers and catchers report for spring training. HECK YEAH! And by training, I mean swatching. I will soon be swatching for my next Crackerjack conceptual knitting project. My yarn this time is Hazel Knits Artisan Sock, in “Nekkid,” “Nickel,” “Collegiate,” and “Carnelian.” To create this set, I actually bought a Seattle Seahawks-themed kit (this was right after the Super Bowl) – it had all the colors I needed minus the orange, in the smaller quantities I think I’ll need for a pair of socks. 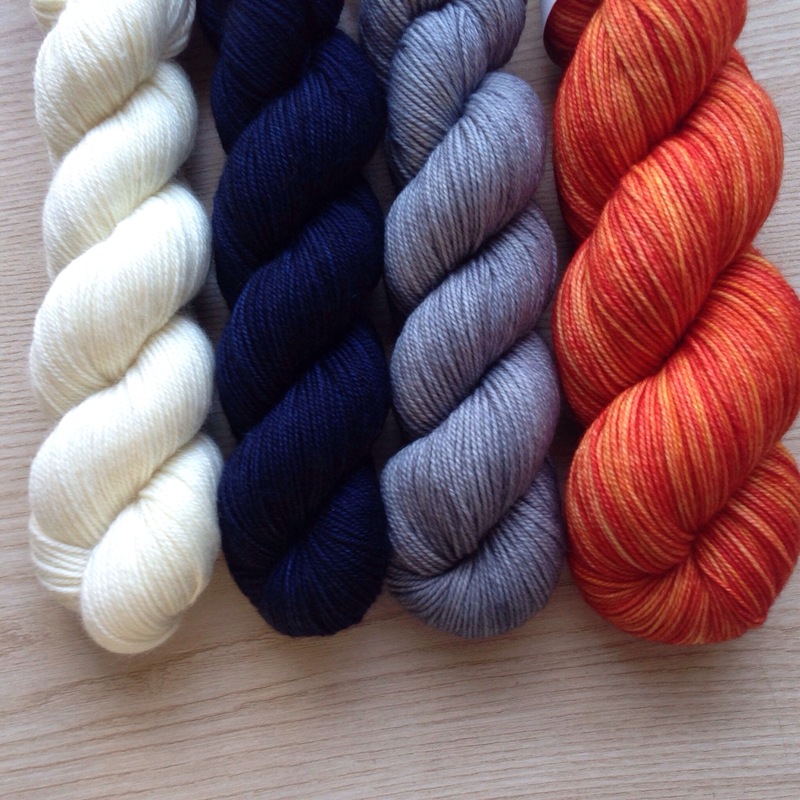 Then I bought a full skein of the orange to complete my set. Now I have a sweet small skein of “Hawkeye” (lime green) leftover for some other fun use. It’s been awhile since I’ve knit with Hazel Knits, and I’m really looking forward to it. The yarn has a great feel, and the hand-painted semi-solids are just perfect. This time around, I’m going to be making… SOCKS. For anyone who has been following my Instagram feed, this should come as no surprise, as I am apparently all about knitting socks lately. It’s funny, I’ve never really considered myself a sock-knitter (though, in truth, I’ve knit my share of socks), but some kind of switch has been flipped in my brain, and all of a sudden, all I want to make it socks. Also, every time I go to Comerica Park to watch the Tigers play, I wish for some Tigers socks, and the souvenir shops have every imaginable thing for sale – except socks. So I’ll just make my own, with stripes keyed to the Tigers wins and losses. I am really excited about this project! I’ll be putting together a worksheet in advance of Opening Day, for anyone who would like to play along, with your team colors. Spring is coming, y’all! It’s also the Chinese New Year today and 2015 is the Year of the Sheep! Go Sheep!! I bought one earlier today to celebrate the Year of the Sheep! Oh that’s a great idea!!! Can’t wait to see how it comes out. I think for the person I’m going to knit for they will like the scarf better but LOVE the idea of the socks. I would be interesting in seeing your schematic! Love the color range, but would be prefer Fredbird colors! !